BART have become aware of several sewage pollution incidents in our rivers over the past few months. Most recently, we were treated to a sudden flow of sewage and silty road run off, complete with sanitary waste, whilst out in the river conducting some habitat enhancement works. We believe that many of these incidents are due to a widespread problem called misconnections. 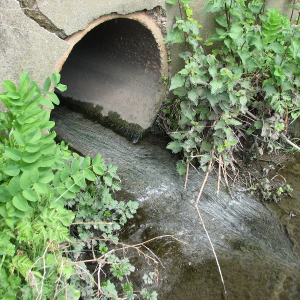 Misconnected pipes are a common cause of pollution to rivers and streams, particularly in urban areas. A misconnection usually occurs when a home or building is newly constructed or extended and the pipes are plumbed incorrectly into surface water drains (which lead to rivers) instead of foul sewer pipes (which lead to water treatment works), resulting in the waste water from showers, baths, washing machines, toilets, etc. flushing directly into local streams and rivers. Similarly, a misconnection of a surface water drain to the foul water drain can result in the sewer being overloaded at times of heavy rain. The extra water adds pressure on the water treatment works and sometimes the only course of action is to release the sewage untreated into rivers or the sea via Combined Sewer Overflows (CSO’s). Release of raw sewer directly into our natural waterbodies is not just bad for wildlife that live and use the water but is also adds extra expense to cleaning our drinking water (and so increases our bills) and means that waterbodies are often unclean for recreation. The level of misconnections in England and Wales is huge and it is estimated that the equivalent of 16 Olympic-sized pools of untreated water enters the aquatic environment every day as a result of misconnections. However, in reality, the number may be much greater. Well, we can’t deal with a problem until we know it is there. By signing up to become BART Beacons, our ‘eyes and ears’ on the ground, you can let us know of any problems on your local river or stream. This is a non-committal form of volunteering that you can do whenever you’re out and about. Contact harriet@bristolavonriverstrust.org if you are interested in becoming a BART Beacon. We have produced the attached handy ID guide to show you what different kinds of pollution look like. You can also help by making sure that you use certified and experienced plumbers to make sure that your waste is plumbed in to the correct systems and not polluting our rivers. In rented properties, you can check with your landlords that the correct set-up is in place. BART are looking into ways of tracing misconnections in the catchment so that the problem can be managed at the source. BART’s pollution spotter guide can be downloaded here.